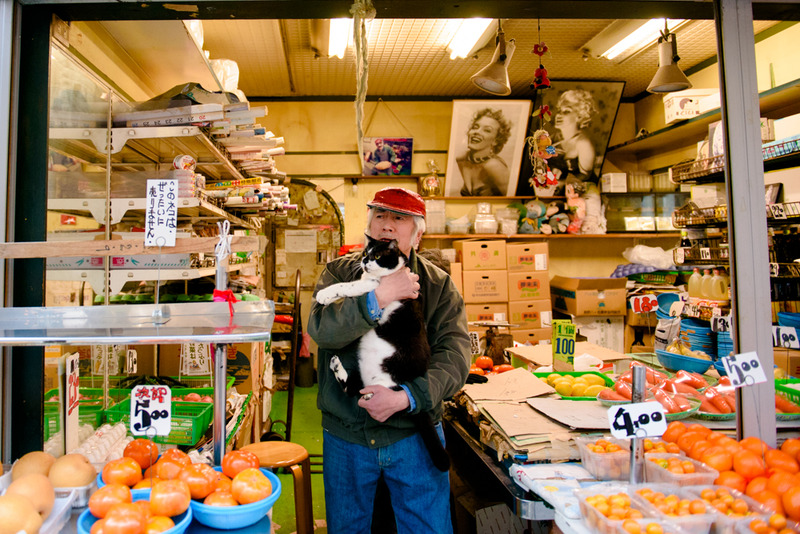 Kato Shoten, a retro-looking greengrocer close to Takadanobaba Station, has been going strong for an awfully long time: it's been in business for a good 85 years by now. The nostalgia virtually oozes through its doors, and if you thought the Doraemon and Astro Boy figurines were enough to put you on a trip down memory lane, wait until you see the veritable shrine to Marilyn Monroe – the back of the store is chock-full of posters depicting the eternal Hollywood star. 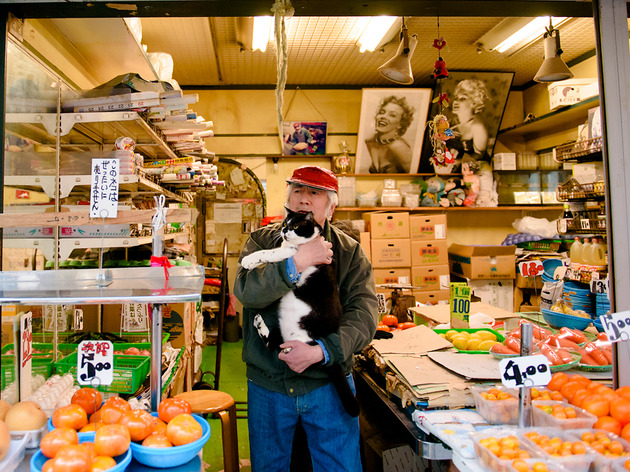 That alone should be enough for you to reroute your weekly grocery shopping to Takadanobaba, but there's more: Kato is also home to two resident furballs, both of whom are real personalities. Meet Bukko and Shiro, our two latest named and shamed Public Cats, who have the honour of working alongside Ms Monroe every day. 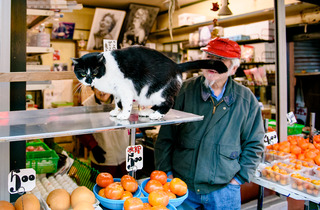 On our visit, the first cat to leap out of the vegetable bag was Bukko, an eight-year-old geezer. He's on the larger side, weighing in at around 10kg – his golden oldie boss can just about still lift him for a cuddle. When poor Bukko was less than a year old, he was left abandoned behind the store. Although Kato Shoten's owners didn't take particular care of him at first, Bukko kept on coming back, and it wasn't long until he had climbed snout-first into the daily runnings of the shop, becoming not only a member of staff but also a part of the family. The shopkeeper's wife named the bedraggled little one Bukko. 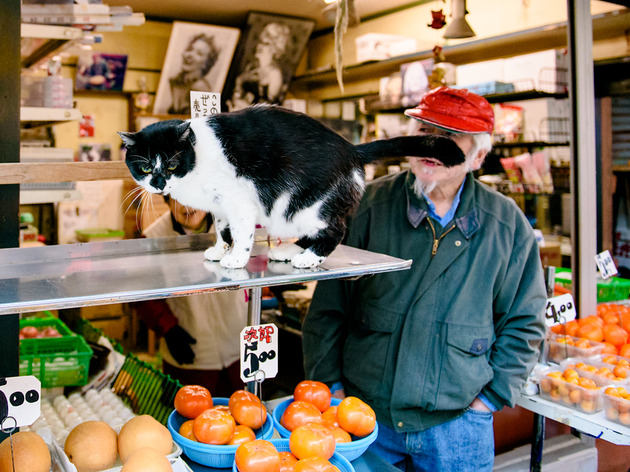 We're not quite sure how that happened – there's no particular meaning to the name, not that we could discern at least – but by now, it's become quite the vogue in the neighbourhood for locals to try and grab the magnificent feline's attention by calling out 'Bukko-chan!' when they pass by. While Bukko was attending to us, another four-legged employee named Shiro sauntered down the road and entered the shop. Shiro loves going for walks, and he can often be spotted flaunting his fur in the area. He also adores shrimp – something that's earned him the punny nickname 'Ebizo', after the kabuki actor. Unlike the laidback Shiro, Bukko has that whole attracting customers move down to the nines. Perched atop one of the shelves at the front of the store, he can get as many as 20 prospective shoppers to stop by just to pet him. He keeps it cool throughout, playing hard to get – until they buy something, we suppose. Other than that, he's a pretty sedentary cat. Shiro and Bukko are obviously the star employees, but the other members of Kato Shoten's staff are definitely worth meeting too. Look out for the owner's handwritten signs, which are always popular with regulars. The shop boasts longer opening hours than your average greengrocer's, so do stop by if you're in the area. Pick up some veg, pet the two boys and pretend you're in an era where people still did stuff like this all the time. Thanks for the nostalgia, Kato Shoten.